You want to grow your towing and recovery company, but at times it can be difficult to collect an invoice, let alone navigate some of the other financial and legal hurdles of running your own business. Competition can be tough, and it is sometimes difficult to stay profitable while also being competitive. Business success demands specialized techniques and approaches to how you operate, and the towing and recovery business is no different. At Recovery Billing Unlimited, we wonít tell you how to tow, how to manage your fleet, or what to charge. What we will do is teach you the advanced business management techniques necessary to bill for your services properly, and ensure that you are paid the right amount, on time, every time. The most effective approach is to work with the insurance company, not against them. 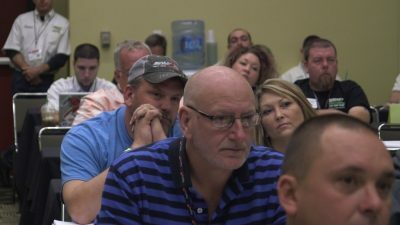 Across the United States and Canada, hundreds of managers and business owners are looking for ways to increase the financial performance of their towing operations. We have helped countless companies to achieve exactly that. We can do the same for you. With Recovery Billing Unlimited you will have the potential to double your bottom line. Bob and Eric Fouquette present advanced business seminars, covering everything from properly writing invoices to learning how to make sure that you are paid by the insurance companies. The techniques that you will learn in your first class will be essential to your business remaining profitable. Classes are limited to 20 companies and are booked on a first come, first serve basis. Don't miss out on this opportunity to maximize your profits and improve the financial position of your towing and recovery company. Call today to reserve your spot! Do your seminars cover towing and recovery techniques? No. Other training institutions teach you how to tow and do recoveries the proper way; we teach you how to be more profitable using the techniques you've acquired by having the ability to bill for your services. Will your towing and recovery financial seminars work for established businesses? Is there follow up training provided? Yes. Included with your initial attendance fee are two refresher courses. In addition, you will have access to our staff 24/7 to assist with any questions that may arise. Who are Bob and Eric Fouquette? Bob and Eric are owners of one of New England's largest and most successful towing and recovery companies. It is their expertise in the industry, and proven success in running a business, that makes them the perfect mentors for your towing operation. Is the seminar just about invoicing? No. Our seminar is an Advanced Business Management Seminar, covering everything from building a business from the ground up to advanced billing techniques. In addition, we have guest speakers that speak on various subjects including legal, insurance, and OSHA. Are seminars only in Massachusetts? Seminars are regularly carried out in Massachusetts; however, we also travel to industry trade shows across North America, bringing our seminars closer to you and your business. Head to the contact page and give us a call, or drop us an email. We will let you know when we're going to be near your area and can help you to book you early so that you have a spot in our popular seminar. Are the seminar bookings for a single seat? No, the initial cost of attendance includes two (2) people employed within your company. One should be the owner, operator, or the general manager. The other should be involved with the financial or accounting aspects of the business. This approach will help you to get the most out of the seminar, and make it easier to integrate the newly acquired knowledge into your business. Our priority is to provide you with all of the knowledge and tools that you need as a towing and recovery operator, to grow your profits and maximize your invoice revenue. We don't use shady business practices or accounting tricks. We focus on teaching you how to make sure you get paid for the work that you've already been doing. Building a proper towing business from scratch. You already know how to run the day-to-day operations, but your billing processes aren't working for you. We will teach you how to streamline your operation with innovative processes that are easily implemented and maintained. Employee training. Professionalism in the workplace and on the job is essential. The image that your employees project in public can determine how quickly and easily you are able to collect payments. Accident Scene Remediation. Don't take a financial hit by unconsciously risking liability at an accident scene. Learn the processes to avoid turning your income into an expense. Professional Invoice Writing. Clear, detailed and legally compliant invoice writing is essential for a professional and financially stable towing company. We teach you how to do this consistently for every job. Insurance Billing. We will show you how to work with insurance companies, not against them. This approach includes writing an acceptable invoice in a format that is easily understood, itemizes your rates, is accompanied by a detailed narrative, and includes a set of photos depicting the scene in its entirety from start to finish. Legal Compliance. We will provide an overview of laws, rules, and regulations that are pertinent to the towing and recovery industry, including local, state and federal jurisdictions. By knowing your rights and obligations, you'll avoid putting your business at risk. Professional Expertise. We love to add variety to our courses by bringing in guest speakers and business mentors. Our guests range from specialists in towing and recovery to experts in the legal and insurance industries. Learn from the most knowledgeable people in their respective fields to help you improve your business methods. With what you learn in our seminars, you will have the ability to double your bottom line. You don't want to miss the opportunity to join one of our seminars. Contact us today and say goodbye to unpaid invoices, unnecessary expenses, and losses for your business. I can’t fathom the hundreds of thousands of dollars that we left on the side of the road in the past years before going to their class. I really don’t see how there are so many towers making excuses why it won’t work for them. I once was like that, along with many others on here and we all had our eyes opened. I just wish more towers would give this type of attitude a chance as it will benefit YOU tremendously. I just took the class yesterday; I flew about 3000 miles to go to this class. I really have to say I have learned more in this 1 day than ALL of the other classes combined. The type of information and experiences that are shared are priceless and are a must for anyone that takes their business seriously and wants to run it like a BUSINESS. I would recommend this class to anyone, the staff at RBU is very nice and makes you feel at home, and will take extra time to talk to you before and after the class, I had numerous questions for them and they answered them without hesitation. There is a certain amount of legal advice that is present and it is very valuable because it is from someone that I would consider an expert because of his time spent defending our industry. I will most certainly apply a lot of what I learned in my day to day operations and will most certainly attend a follow up class ASAP. We at Nelcon have taken this class and on a scale of 1 – 10, it’s easily a 50+ that’s how good this class is. If you’re serious about this business then you need this tool in your tool box. Eric and the entire Fouquette family are second to none. They not only care about their business they care about the entire industry and are constantly coming up with ways to improve it for everyone!!!! Please attend the class and I would be very shocked if you did not agree with everyone here. Action Auto Body Towing, Inc.
Well where to begin that’s a tuff one for me with this post. I will start by saying I went to the RBU class to learn how to make my dad’s towing business more profitable because we were working all the time and not seeing the profit for all the missed dinners, birthday parties, nights out with friends, or good night of sleep without the phone ringing(this list could go on). The very first night at the meet and greet we learned enough that we paid for the cost of the class that night through a job that was going on back home!!! Now that’s a return on investment and I hadn’t even been to the class yet!!! Over the weekend Bob, Eric, and Linda made my wife and I feel like we were part of their family they were the perfect host! When we returned home from the class we started to implement some of the things we learned, the change in our business finance’s was unbelievable and what was more amazing was the passion that I had lost for the business had returned it was fun again to go to work because we were seeing the fruit of all our hard labor. If you haven’t been to the RBU class just go it will be some of the best money you have spent for your business. I am so confident in this seminar if you have any doubts feel free to Call Me. Bob, Eric, Linda and the gang at R.B.U. run a top notch class that was far beyond my expectations. This is more than just billing info this is a business building seminar and I can’t believe how much I have been missing. If you are worried about getting your money back then you would be the fool. The best part is that it is explained in a way that we should all be able to comprehend. Don’t keep leaving money on the table. These guys really have an agenda, which will only strengthen the industry as a whole. My biggest mistake was not taking this course sooner. You guys run a top notch operation and I cannot say enough. THANK YOU THANK YOU THANK YOU R.B.U. Roadside Rescue & Transport Inc.
Bob, Eric, & Linda are top notch!!! Class was great a lot of info. You guys are down to earth, my kind of people. Glad I went and was well worth the money, that’s for sure. As a testimony to the class. We attended the January 2010 class and have since been able to collect on recovery’s we would have walked away from in the past. With the knowledge form this seminar and help from the staff at R.B.U we were just paid on a vehicle with NO collision and minimum liability. We spent all lot of time on scene making it right while satisfying not only the home owner, but the town in which the accident happened. In summary, I highly recommend attending this seminar to educate yourself on how to bill correctly. It’s worth every penny that you’re leaving behind if you haven’t attended this class yet. We attended the first class in mass and still can’t believe the money that we left on the table before we attended. A 10 rating would be an understatement. Thanks again. Winter’s Towing & Garage, Inc.
You can’t ask for a better bunch of guy than Bob and Eric, and the whole RBU team. I have learned a lot of things then and now and still to this day if I have any questions all I have to do is call and ask, and they’re more than willing to help out any way they can and get any info that I might need. Thank you for all that you do for the towing industry. This class is above and beyond what it is advertised as. Thank you to the Fouquette Family for all your hard work and effort for our industry. If you are on the fence about going to this class trust me YOU CAN’T AFFORD NOT TO!!!! We just got paid on a job that never in a million years would we have without their help. These people truly love this industry and want all of us to get the recognition we deserve as Professionals. This class has helped us to work safer and more efficient in places that we overlooked, didn’t realize, or just plain ignored because of lack of funding. In the future of this industry you will do it right or not do it at all. I support the belief of doing the job to the very best of your abilities and the safest ways possible.